The Detroit area has been a ray of light for solar power innovation over the last few years. In 2016, DTE Energy and the city of Detroit broke ground on a 10-acre solar array, the O'Shea Solar Park, on the borders of Greenfield Road and I-96. Now operational, the grid linked system features 6,500 solar panels and can generate enough juice to power more than 450 homes, making it one of the largest urban solar arrays in the Midwest. The headquarters of Ford in Dearborn and the IKEA store in Canton have also received substantial attention for installing roof-top solar arrays at their facilities. But there's a lot of energy going into solar among lesser known organizations too, some of who have been partnering together to take the application of renewable resource in new directions. Ryter Cooperative Industries (RCI) is a project management company based in Sterling Heights that specializes in planning and implementing clean energy solutions. A worker-owned low-profit limited liability company (LC3), RCI focuses its energies on helping with community-based organizations integrate green energy and energy efficiency into their work. To do this, the cooperative draws on a network of mechanical and electrical engineers, inventors, IT folks, and others to meet its clients needs. 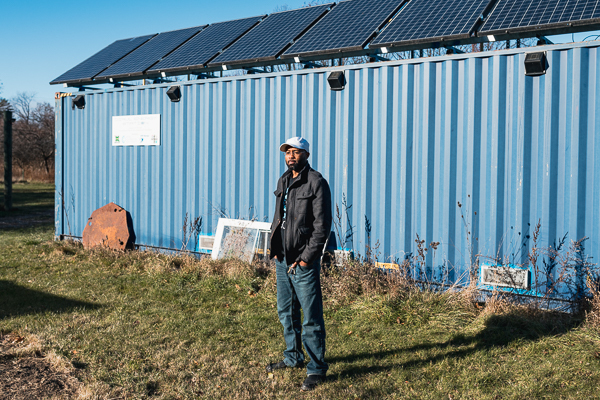 It's highest-profile project, so far, is building a three-kilowatt solar energy station at D-Town Farms, a seven-acre urban farm located at Rouge Park in northwest Detroit. Completed with the assistance of DTE in 2015, the Dirul Energy Station, as it's called, has the distinction of being Detroit's first fully off-grid solar power generation plant. "We took a shipping container and 10 solar panels that were donated by a local fabrication lab and retrofitted a 40-foot shipping container to set up a utility station," RCI Founder and CEO Ali Dirul says. "It provides solar energy that's stored into a battery that can be distributed to the farm so they can charge cell phones and walkie talkies, run power tools, saws, composters, things like that." RCI also built a solar-charging kiosks for the Charles H. Wright Museum during the African World Festival held there in 2016. Asked about the benefits of solar, Dirul remarks that it's clean, renewable, and offers stable power during blackouts. As for the challenges of solar, well, that depends on the weather and time of year. "The only consideration we have in Michigan is ensuring we get a decent amount of light to fulfill the expectations that people have, so that's all about managing expectations," he says. 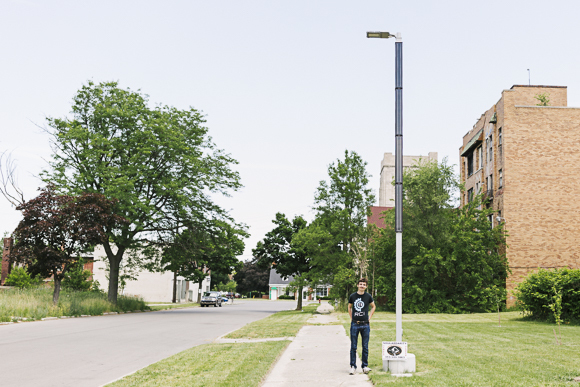 In addition to doing its own projects, RCI has been collaborating with Soulardarity, a group known for installing solar power street lamps in light-starved areas of Highland Park, on a project called PowerUp. Essentially a bulk-buying program, PowerUp allows residents and homeowners to purchase solar lights and equipment at a reduced rate. "In our first year, we provided 50 small security lights," Soulardarity's Executive Director Jackson Koeppel says. "And in the second year of the program, we have doubled the financial size of the order and started offering solar rechargers and generators as well." According to Koeppel, the two groups are now looking to use the success of their first two years to grow their bulk purchasing efforts. As for Soulardarity's own work, the 150-member organization has installed a total of six solar street lights in Highland Park since it began its work in 2012. Four are owned and operated by Soulardarity and two are partnerships with other community organizations. What's more, the group recently finished a fundraiser to install their first "smart" solar street light, which will be equipped with WiFi and LED lights. While Soulardarity does do a lot of infrastructure work, on a deeper level it envisions itself as an energy democracy organization and supplements nuts-and-bolts work with education, door-to-door organizing, and inter-group collaborations. It's even delved into policy. Last year it proposed an ambitious plan to partner with the city of Highland Park to install 1,000 solar powered lights on local streets, though there's been little movement on that yet. Soulardarity's first solar smart light is slated to be installed next April on the grounds of Parker Village. A former Highland Park elementary school, the two-building complex is set to open its doors next year. "Parker Village is meant to be a community resource center," Founder Juan Shannon says. "Our primary focus is renewable energy, technology, and aquaculture." Among other things, the for-profit facility will feature an urban farm, cafe, performance space, media lab, co-working spaces, and the offices of Shannon's media company, Modern Tribe Communications. The roof will be equipped with a solar array and wind and geothermal energy generation technologies are also being explored for use at the complex. Shannon bought the building in 2015 and has been working with architect Paul Bierman-Lytle, a nationally recognized leader in sustainable design to realize his vision for the place. Parker Village will hold an introductory launch of its garden and garden cafe on April 20 of next year, which will be followed by an energy sustainability tech conference on April 21. "We're already talking to a variety of tech companies and energy companies," says Shannon. 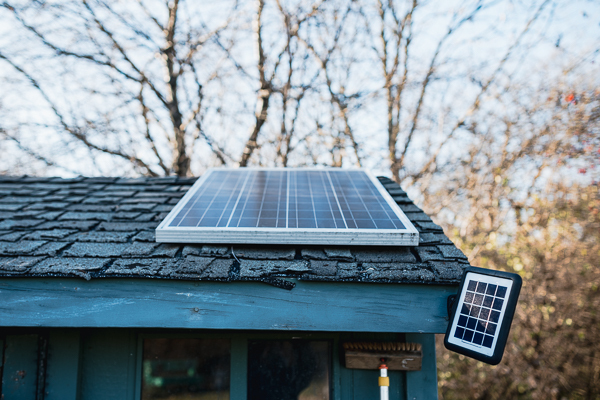 "We're in the process of creating a network that will be bringing in a lot of resources for people to get their solar information, solar equipment, installation and training." Clearly, there's a lot going on with solar in southeast Michigan right now. But what about the prospects for the future? Do they look sunny? Liesl Clark, President of the Michigan Energy Innovation Business Council, seems to think so. "The price of solar has dropped dramatically in the last couple of years," says Clark. "Its coming down in cost pretty substantially, making it much more competitive with other types of generation sources." While the prices for both solar panels and batteries have declined in recent years, the trade group president notes some of the tax incentives that have been around in the past will be disappearing. While there isn't currently any state funding for renewable energy, the federal government does offer a 30 percent investment credit for solar deployment. Unfortunately, these federal credits are currently in the process of being phased out and it is uncertain whether they will be renewed by Congress. Homeowners who still want to save some money can enroll in a net metering program that allows them to transfer excess solar energy collected back into the power grid and use it to credit on their regular energy bill. But what about the numbers for southeast Michigan in particular? Well, Clark says they're looking good now, and that's great news for the future because when people see other homeowners and local businesses using solar, they're more apt to jump on the energy bandwagon. "There are just going to be way more installations," she says. "A couple of studies have shown that once there are six installations per zip code, people realize that solar works in their community. "Solar in the Detroit area and Michigan in general is just going to take off in the next year or so."